Among the 9 victims killed in a national forest were 3 generations of one family. 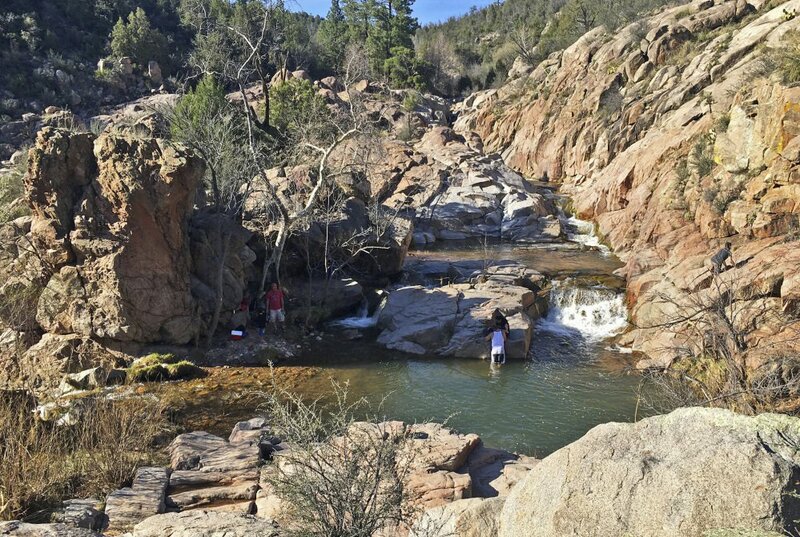 TONTO NATIONAL FOREST, Ariz. – The flash flood that killed nine people in an Arizona canyon began its deadly descent as an impressive but avoidable surge of churning water, black with cinders from a recent wildfire and choked with tumbling tree trunks and limbs. By the time it reached a rocky swimming hole several miles downstream, it was a roaring torrent 6 feet high, and an extended family celebrating a birthday while seeking refuge from the summer heat had no warning – and no chance to escape. The victims had been lounging Saturday in the Water Wheel swimming hole, where the river narrows and rocks create pools and a series of small waterfalls. The narrowing of the canyon squeezed the flow of water and helped give it deadly force. The river roared to life after a thunderstorm had dumped up to 1½ inches of rain in an hour, prompting a flash-flood warning from the National Weather Service. But there is little or no cellphone service in the remote area, and without a weather radio, the swimmers would have been unaware. Carrie Templin, a spokesman for the Tonto National Forest, said people headed to the forest should check weather alerts ahead of time to determine whether it’s safe. It is hard to predict where rain will fall in the desert Southwest, and people should know that heavy downfalls can cause flash flooding, Templin said. “How do you warn people about Mother Nature?” Templin asked. About 40 volunteer workers and four search dogs looked for the missing man. 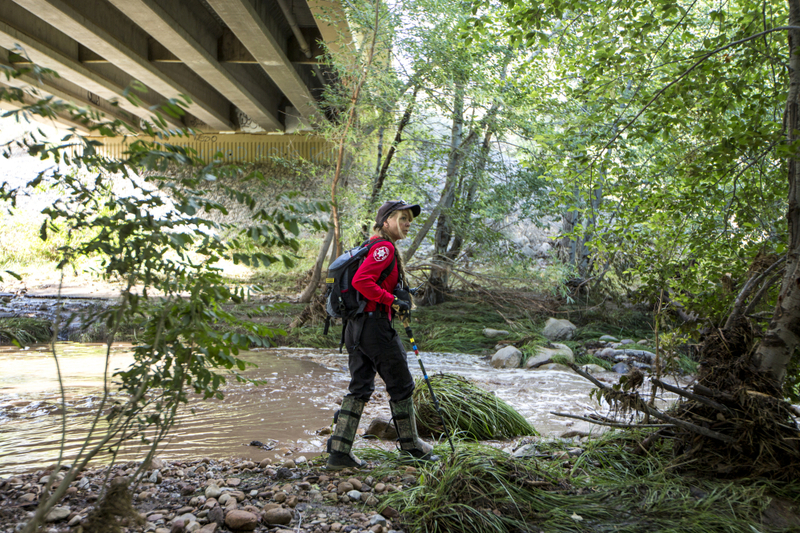 About five miles up the mountain, where a June wildfire scorched 11 square miles of the Tonto National Forest, Scott Muller first spotted the water rumbling down the nearly dry East Verde River. He was spending the day with a dozen other members of AZ Krawlers, a volunteer group of Jeep owners that was checking roads and trails for dangerous erosion and missing signs. He began making a video with his phone and comfortably scampered to the bank before water clogged with debris whooshed past. In a wildfire area, the scorched land repels water, making flooding worse. Muller and the others got in their vehicles and rushed down the mountain on an unpaved fire control road to get another look. Emerging onto a paved road, they drove up the mountain to a bridge that was below where the waters would sweep through the swimming hole. There, Muller said, they saw a couple with two young children playing in the placid river and told them to get out because the river would soon become a monster. Neither Muller nor the group’s leader, Ken Maki, said they knew of the swimming hole that was about a mile up river. It wasn’t until that night that they learned of the deaths. The dead youngsters were identified by authorities and family members as 2-year-old Erica Raya-Garcia; Emily Garnica, 3; Mia Garnica, 5; Danial Garnica, 7; and Jonathan Leon, 13. Also killed were Javier Raya-Garcia, 19; Celia Garcia Castaneda, 60; Maribel Raya-Garcia, 24; and Maria Raya-Garcia, 26. The group had gathered to celebrate Maria Raya-Garcia’s birthday. Among those killed were her husband and three children. In 2015, seven people were killed in Utah’s Zion National Park when they were trapped during a flash flood while hiking in a narrow canyon. In 1997, 11 hikers died near Page, Arizona, after a wall of water from a rainstorm miles upstream tore through a narrow, twisting series of walls on Navajo land. Hartounian reported from Phoenix. Contributing were Justin Pritchard and Michael Balsamo in Los Angeles, Angie Wang in Tonto National Forest and Jacques Billeaud in Phoenix.